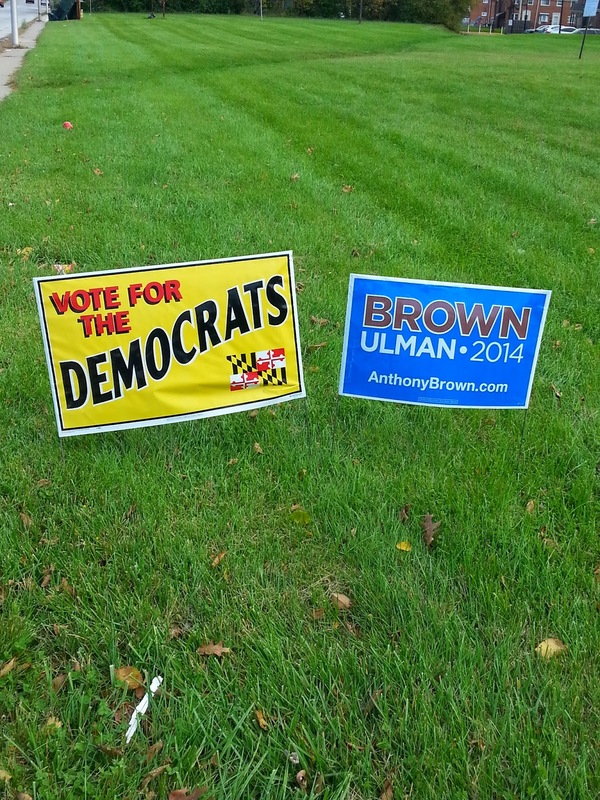 Democrats here in Maryland sure have been desperate as of late. If anyone who knows this state knows that it is a solidly blue state and is usually considered a safe Democrat state when elections come around. Well this year something is different. It was simply assumed that Martin O'Malley's Lt Governor Anthony Brown would be a shoe in to be the next Governor of Maryland. Number one, he's a Democrat. Number two, he's black. Well that isn't proving to be the case. His challenger Republican Larry Hogan has come on strong in recent weeks and scored very highly in the last governmental debate between himself and Brown, and that has Democrats here in Maryland very nervous. Many of the national pollsters are now calling the Governors race a toss up. Since Anthony Brown can't run on the coat tails of Martin O'Malley's disastrous two terms as governor, he has resorted to a barrage of negative attack ads against Hogan for which backfired. When people see Anthony Brown they see the third term of Martin O'Malley tax increases, and Anthony Brown being a liberal Democrat can't do anything to prove otherwise.Democratic operatives know that their best chance to win hinges on the turn out of their base. If Democrats have a lite turnout, that bolds very well for Larry Hogan and other Republicans. Larry Hogan's supporters are fired up and energized. That same can't be said for Anthony Brown's supporters. This is why the Democrats have resorted to race baiting black folks in Baltimore City to try and get them to vote. Yesterday as I was driving around Baltimore City, I noticed these yellow yard signs plastered everywhere reading "VOTE FOR THE DEMOCRATS". Normally a campaign sign would say vote for the particular candidate not the political party. This is where it gets "interesting". I had to take care of so some business in Baltimore County that day as well. So as I was driving around Towson, Lutherville, Parkville, Carney etc, there were political campaign signs for people running for the respected public offices. What I noticed what was missing were those "VOTE FOR THE DEMOCRATS" signs that were plastered all over Baltimore City. So I started thinking, how could this be possible? I would assume that the Maryland Democratic Party and the Brown campaign would want people in Baltimore County to "VOTE FOR THE DEMOCRATS" also right? The only logical conclusion is that these signs were placed in predominately black neighborhoods. because they know they need a strong turn out from the two biggest black jurisdictions in Maryland which are Baltimore City and Prince Georges County. Of course Maryland Democratic leaders would deny this is an attempt at race baiting, but I know what they would say if the Maryland Republican Party or Larry Hogan was to place signs all over Republican strongholds on the Eastern Shore and Arundel Country which have mostly white residents reading "VOTE FOR THE REPUBLICANS". I would like to ask the person or persons who came up with the "VOTE FOR THE DEMOCRATS" signs one question. That question would be "WHY vote for the Democrats"? What, just vote for the whole party, because the sign says to do so? Barack Obama came to Maryland the other day to campaign for Anthony Brown at a rally in Upper Marlboro. Even Big O can't help Anthony Brown, people mostly black started to leave as Obama was still speaking. If the first bi racial president being passed off as black can't help Anthony Brown, it might mean that all the race baiting political signs won't be able to help him either. I knew this was gong to happen. Liberal politicians are operatives are such predictable creatures of habit. A few months ago when the Ferguson rights started to happen, I commented on how Democrats were going to use the civil unrest to politicize the Saint Michael Brown shooting. 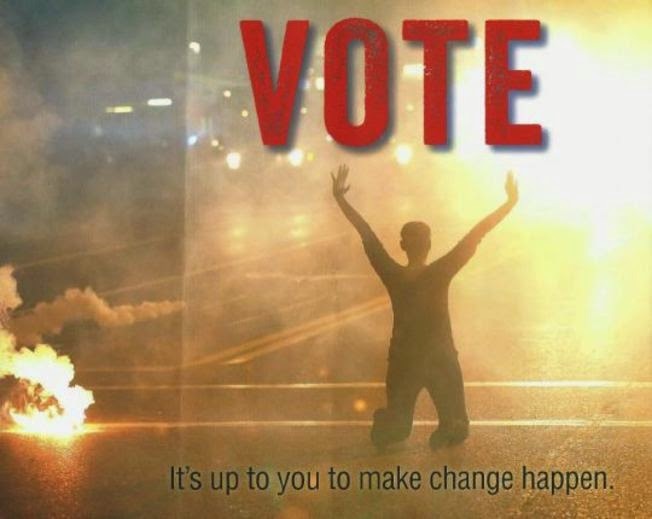 I noted that a week after the shooting Democrats were orchestrating a voter registration drive a block from were Michael Brown was shot and killed. With Democrats facing a political blood bath rivaling that of the 2014 midterms, I should have known that Democrats were going to go full in in their race baiting and race pandering to blacks to try and at least stem their losses, and they are doing it on the corpse of Saint Michael. 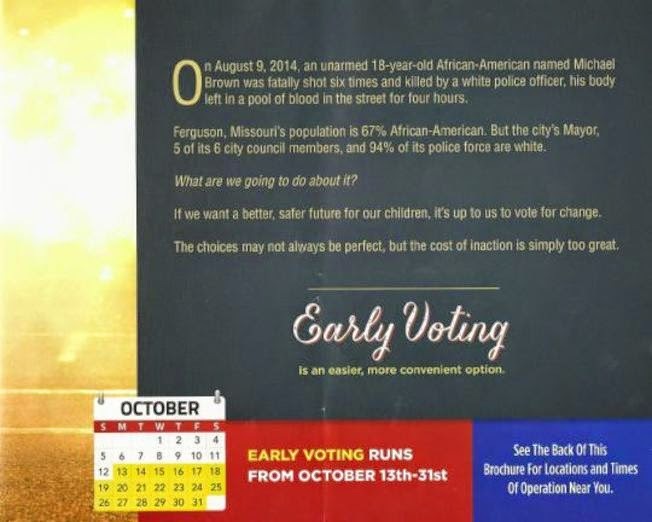 The Georgia Democrat Party is sending out fliers to black residents using Ferguson in order to gin them up to vote. This is utterly despicable. Notice what's missing. 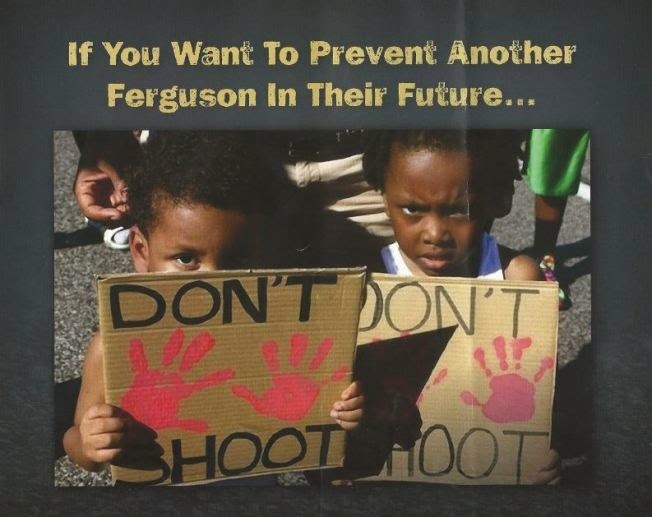 Any explanation on how voting for Democrats is going to actually prevent "another Ferguson in their Future". This reminds me of about 5 years ago, when I got into a debate with a white Democrat liberal who actually told me that "we keep the cops off of you". When I asked him how, he was stuttering all over the place and eventually changed the topic. I guess the message is vote and you'll never have to raise your hands again? Maybe I missed the dramatic impact of the message. How nice, the Georgia Democratic Party made sure to inform black folks about Early Voting. This way more black toddler children like the ones in this ad can be saved. I'm not sure how far Georgia is from Ferguson Missouri, but I think it's safe to say that it's not close. This should send a loud message to rational minded blacks. That message is that the Democratic Party can only use race baiting tactics like this in order to communicate with them. It's never about the real issues, nothing of substance. No mention about creating jobs, job training, helping black entrepreneurs to start businesses and growing communities, lowering taxes, etc, Nope just this, just race baiting. Sadly, because this tactic always work, Democrats see no need to change it. When liberals cry racism, you know that there is more to the story then what they are claiming. This is the photo that is popping up on Facebook and Twitter by black and white progressives. Thomas Duncan was a citizen of the West African nation of Liberia. Liberia is one of the hardest hit nations in the Ebola outbreak. For the past few days I've had to listen to the conspiracy theories put out by Thomas Duncan's family and certain blacks in general that the reason Thomas Duncan died is because he was black thus his healthcare was inferior to that of the white Missionaries who were treated two months prior. With progressive minded people especially black ones, everything has to be racially related, and I do mean everything. 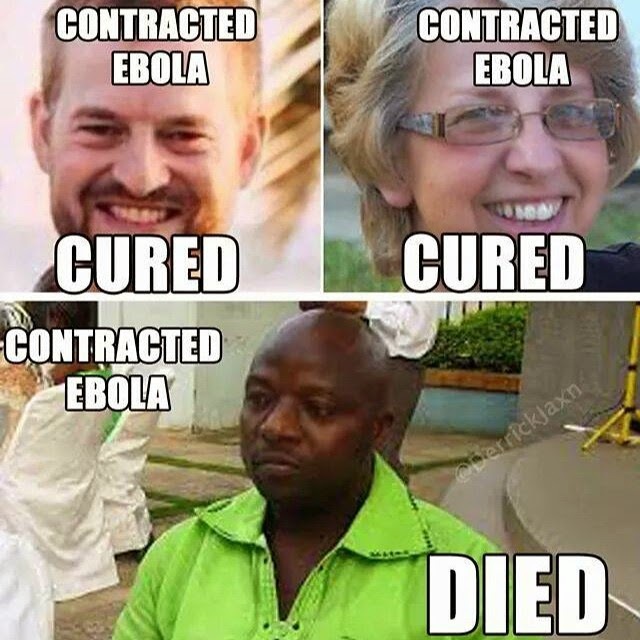 They are obsessed with race, and they call others racists if they don't see things through the same racially cracked lenses as they do.I have been reading the blogs and watching videos of racially paranoid people spewing baseless allegations that the only reason Thomas Duncan died was due to racism in how he was treated more so then the actual Ebola infection that he had. I will keep repeating this saying motto, because again it holds true. When people think with their skin , they always come off sounding like utter fools.. The nephew of Thomas Duncan told CNN that he believed Mr. Duncan's death was contributed to racism. the experimental drug Z Mapp which was attributed to saving the lives of the two white missionaries ran out in August, two months before Duncan can to the U.S states. That is why they had to treat him with another drug.. Again, the racial conspiracy mongers left that important bit of information out as well. Also, the two white missionaries were flown to Emory University Hospital which specializes in treating highly infectious diseases like Ebola. Texas Presbyterian is just a regular hospital. Oh wait, there's more. Texas Presbyterian Hospital was equipped to deal with patients with Ebola before they weren't. That isn't a John Kerry moment. Texas Presbyterian Hospital had an Ebola machine to diagnose patients but thanks to the Federal Food and Drug Administration guidelines they weren't allowed to use it, because it wasn't FDA approved. In an odd twist, the same device is being used in Africa by U.S Military doctors!!! So maybe the racists are in Obama's Food & Drug Administration? Doctor Gary Weinstein who has treated all three Ebola victims responded to the baseless charges of racism playing a role in the death of Mr. Duncan as "Remarkably Insulting"
The charges of racism are not only insulting, they are just stupid and comes from very gullible and simple minded people. Many of these people who are making these claims also believe that the Federal Government created the AIDS virus to kill off blacks and gays. Oh can't forget that they also believe that George Bush wanted to drown black people in New Orleans and used Hurricane Katrina as a cover to do it. Racism to black and white progressives is "any outcome that doesn't turn out the way they want it." That goes from Officer Darren Wilson not being charged, George Zimmerman not being convicted to something like this. The problem with the left and their constant baseless charges of racism is that people are starting to tune them out as paranoid racial fanatics who are prone to say that any situation that doesn't give them a favorable outcome as being racist. Unfortunately crying fake racism can take attention away from when a true incident or racism is shown but nobody will believe it. Get Ready for Furgerson v2.0 this time via Saint Louis. Well folks, it happened again. Another innocent angelic young black male 18 who was just skipping while singing to his grandma's house was shot and killed by a no good racist white police officer Wednesday in Saint Louis. Jesse & Al have already been notified or they have notified the family that they are on the way. Wednesday night in the Shaw neighborhood of Saint Louis, an off duty police officer working as a neighborhood security officer confronted three black teens as he was patrolling the area. The teens fled as he drove by. The off duty officer who was wearing his uniform went after them. What ended up happening apparently one of the suspects Vonderriit Myers was caring a gun and fired at the officer 3 times but his gun jammed, the officer fired back at him at least 17 times killing him. The suspect's gun has been recovered, so this isn't a case of a cop killing an "unarmed" black person as the Saint Michael disciples are protesting, yet they are protesting over this police involved shooting of an "armed suspect" who fired on a cop. My thoughts on the latest "innocent precious angel" to be shot and killed. Truly on what grounds are protests warranted for an armed attempted cop killer? Do the protesters in Saint Louis know something that I don't? In the Saint Michael incident, their theme was that Saint Michael Brown was unarmed with his hands up right? But what happened in Saint Louis was the complete opposite. The guy was armed and fired at the off duty police officer who was in his police uniform, yet "they are protesting" the shooting? The Saint Louis Police Chief Sam Dotson gave a press conference on the shooting. As I said many times, the media loves stories like this and come running like starving dogs to a dinner dish in which the "victim" is black and the cop is whit., Any other racial combination of the cop and victim they could care less in covering it. I know these people all too well. New York Times "New Outcry unfolds after St Louis officer kills black teen"
The Week "Black man fatally shot by white off duty police cop in Saint Louis"
Los Angeles Times "Tensions rise as white St Louis police officer shoots black man dead"
In typical liberal fashion, they are actually blaming "racism" with the Secret Service in protecting Obama. Most blacks think Obama's race has something to do with it, but that isn't saying anything new. Most blacks are racially paranoid to begin with, so everything is racist to them even when the facts prove otherwise. Unfortunately, I live in Maryland, and again unfortunately my CONgressman is Ellijah Cummings. I'm sure you all have heard that name before if you follow politics. He is a racial agitator and a member of the prop group the Congressional Black Caucus. It's going to to be interesting to see what these people do when Obama is gone, and they can no longer use Obama's race as a political weapon or to cry racism when the least little thing happens to him. Progressives are good at using the race card at every conceivable turn, they just aren't good however in ever backing up their claims. This is why they always lack credibility when they do it. For example, Elijah claims that blacks are worried that the Secret Service somehow has a racist agenda to have Obama assassinated or something due to the recent security failure of an intruder jumping the White House fence and making it into the White House. According to Cummings, 85% of the blacks he talked to claim that Obama isn't be protected like previous presidents. If he did indeed talk to blacks who think this, then they are modern day fools and are also fools to history. They are fools anyways but that's another story. I wish I could ask these fools who think there is a racial conspiracy by the Secret Service against Obama if they think racism played a role in President Ronald Reagan nearly being assassinated on March 30, 1981 and did racism play a role in President John Kennedy being assassinated in Dallas on November 22, 1963? I guess these two presidents were the wrong race for the Secret Service I suppose. This is why I've always been saying that it's racially oversensitivity blacks and white guilt progressive whites who are the ones who keep trying to keep racial tension going in this country. There is "no" racial conspiracy by the Secret Service . Since it is impossible to reason with fools, they are going to think otherwise facts be dammed as usual. I wonder how these blacks would have felt if George Bush was assassinated? That is a good question. The same people who are crying racism would have been glad if Bush was shot. Matter of fact there were progressives during Bush's presidency who wanted him assassinated. Oh I forgot, I shouldn't haven mentioned the facts.